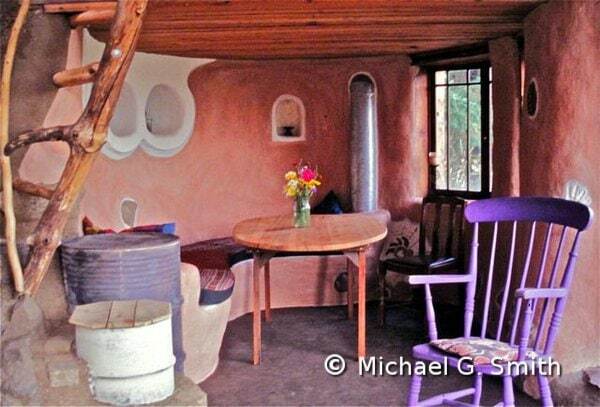 The clay paint in this cob home was made from locally harvested coral colored clay. Did you know that commercial paints are a leading contributor to interior air pollution? Luckily, you can make your own beautiful paints out of simple, non-toxic ingredients. Natural paints can be many different colors and textures and can adhere well to almost any wall surface, although sometimes you first need to make an “adhesion coat” or primer. 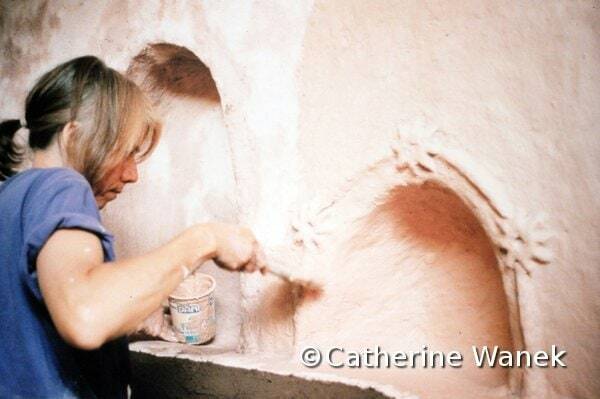 Applying alis over a clay plastered wall. All paints include some sort of binder that sticks the other ingredients together and to the wall. There are many natural binders, including casein (milk protein), egg yolk, and lime. One of the easiest and most reliable kinds of homemade paint is clay paint or alis. The recipe I use includes clay (usually either a store-bought powdered clay or a found “wild” clay), flour paste, and pigment. You can also add mica powder, fine sand, and even very finely screened straw for a more interesting texture. Clay paints are a natural over clay plasters, but they also work on top of sheetrock and wood.